Carriage heating unit TDB 968009 (previously 24142) at Reading on August 10th 1980. The fifteen year eight month career (in revenue earning service) of D5142/24142 was spent allocated only to London Midland Region depots. A further seven years two months were spent as a carriage heating unit. No.1 cab roof acquired Class 25/1 style roof with horn receptacles. 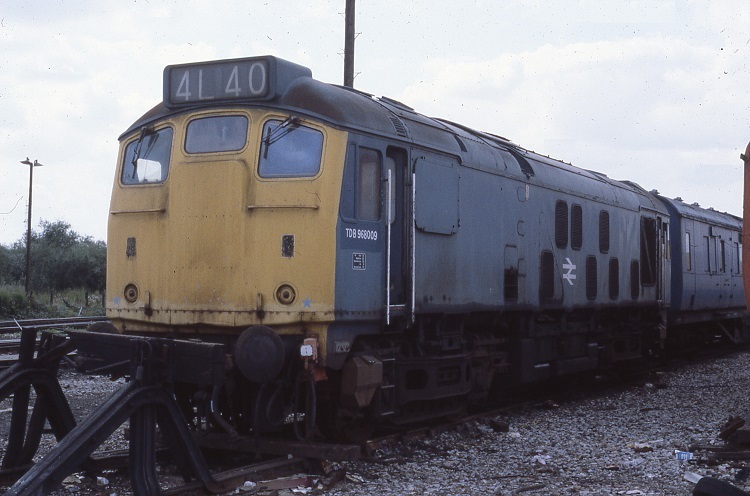 After withdrawal 24142 was stored at Crewe from February 1976 to August 1976 when it was pulled from store and transferred to Departmental service. It was renumbered TDB968009 and moved to the Western Region. After its carriage heating unit service ended 24142/TDB968009/ADB968009 was broken up during September 1984. Noted Derby Works February 1962. Noted Derby Works June & July 1963. Noted Derby Works December 1963 - February 1964. 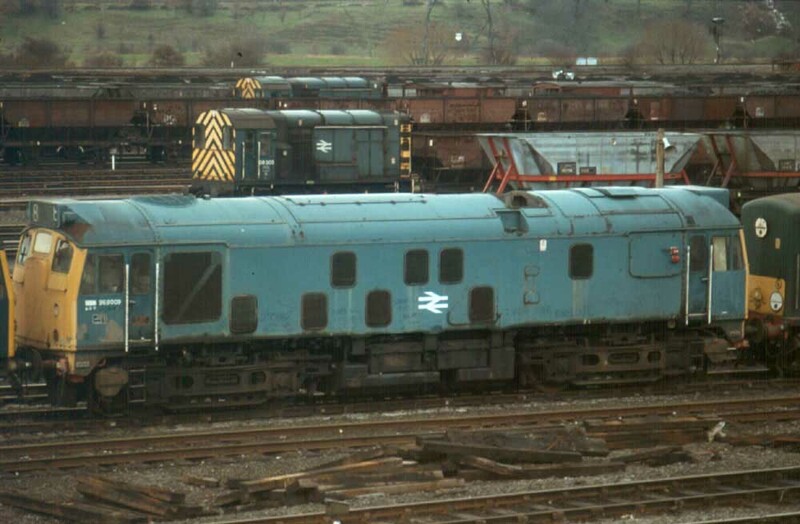 Noted Derby Works August 1974. On September 29th failures caused headaches in the Watford area. Just before noon D5142 on the 11.25am Camden – Edgeley freight caught fire at Carpenders Park, necessitating use of the slow lines for all traffic. This obstruction had just been cleared when D1 on the 8.15am Manchester – Euston caught fire near Kings Langley, the offending locomotive being removed to Watford before being forwarded to Derby Locomotive Works. During March D5142 was noted on the Chellaston branch with a lengthy train of coal wagons and a coach, was this some sort of test working? Condition March: green livery with small yellow warning panels, curved upper corners, warning panel does not completely cover frame level stripe, shortened fuel & water tanks, ridge sided sandboxes, three-rung bogie mounted footsteps, cantrail water filler cover present, '9A' stencilled on No.2 cab bufferbeam (2nd man's side). At the end of May D5142 was on banking duties at Peak Forest. Condition May: green livery with small yellow warning panels, curved upper corners, warning panel does not completely cover frame level stripe, shortened fuel & water tanks. During January the 17.45 Manchester Victoria – Glasgow was frequently hauled by D5142 as far as Preston. Condition August: green livery with full yellow cab fronts, gangway doors in place, some valencing still present. Photograph collection of Ian Hammond. Its May 12th 1973 and 5142 & 5032 have arrived at Aberystwyth with a special. 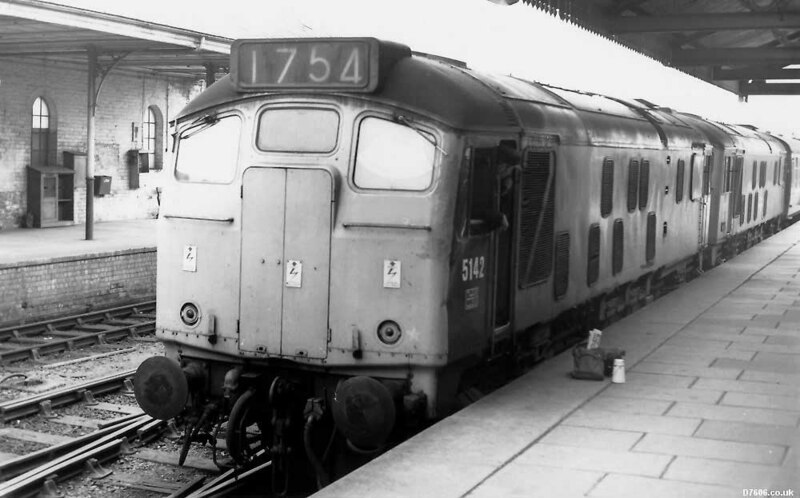 At the end of August 24054 & 24142 were pulled from the deadlines at Basford Hall and sent to the Western Region for further use as carriage heating units. On August 31st they arrived at Exeter Riverside at 4.38pm behind 45012 as part of a milk train, or an 'unidentified' fitted freight (6V53 Down Stoke - St. Blazey china clay empties from Bescot is a candidate), then 45012 tripped the Class 24s to Exeter stabling point, by September 3rd they were still at Exeter but now coupled to a BV ready for onward movement to Laira. External changes to the two locomotives were minimal. The multiple unit jumper cable and receptacle were removed from the bufferbeam and replaced with the typical electric train heating (ETH) jumper cable and receptacle. An external set of controls were mounted on the valencing above the sandboxes and later a light was fitted to the boiler room blanking plate, presumably to warn staff of when the unit was in operation. Photograph courtesy Tony Sayer. As many Class 24s made their way to the breakers yard 24142 received a new lease of life as a carriage heating unit on the Western Region. Its first port of call was Laira, seen here on September 19th 1976. On May 9th a reshuffle of the Western Region carriage heating units took place, with unit TDB968008 (24054) moved from Penzance to Plymouth, whilst TDB968009 (24142) moved from Plymouth to Worcester, being noted at Worcester during September. Condition September: steam pipe connections still present (had been removed when seen at Stratford after withdrawal). 24142 was noted at Worcester during April -June. 24142 was noted at Laira during August. 24142 was noted at Reading on August 10th. Noted April/May at Reading, with the number prefix changed from TDB to ADB. Condition April: steam pipe connections still present (had been removed when seen at Stratford after withdrawal). TDB968009 (24142) was noted at Cardiff July 17th/25th/27th, having recently arrived from Reading. Noted October 27th at Ebbw Junction. On November 5th it moved from Ebbw Junction to Landore, for use at Maliphant. Here it replaced Co-Bo D5705, which moved to Bristol and later Swindon. At some point the TDB prefix was replaced by ADB. 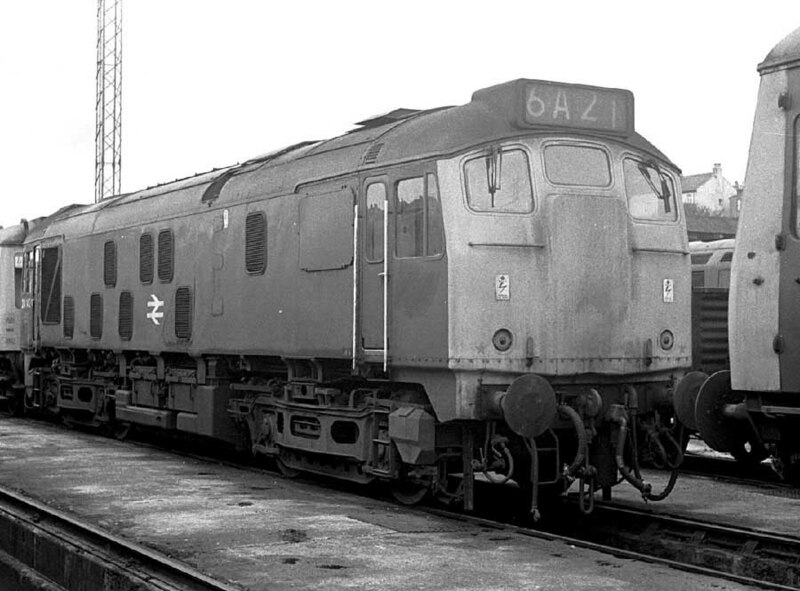 The completion of the Crown Point (Norwich) carriage depot led to a significant shake up of the various train heating units with a number of the former Class 31 & BTH units condemned. Mid September saw ADB968008 (ex 24054) moved from Newton Abbott to Cambridge (arriving December) to act as a spare whilst withdrawn ADB968009 (ex 24142) was moved to Stratford for spares removal prior to being sold for scrap. From October to December 1982 ADB968009 (24142) was at Stratford, and it appears to have been withdrawn during this same period. ADB968009 (24142) was noted dumped at Healey Mills from March 1983 to August 1984. Scrapping occurred at Coopers Metals, Attercliffe during September 1984, this would be the last Class 24 broken up, though a number of its parts, including a bogie were saved for 24054. Photograph collection of webmaster. ADB968009 (ex 24142) was noted dumped at Healey Mills from March 1983 to August 1984. Scrapping occurred at Coopers Metals, Attercliffe during September 1984, this was the last chance for the preservation of a Derby built Class 24, all the other preserved examples are Crewe built. Condition final: blue/yellow livery, gangway doors sheeted over, shortened fuel & water tanks, blanking plates fittted, hand/footholds plated over, ridge sided sandboxes, three-rung bogie mounted footsteps, Class 25/1 cab roof fitted at No.1 end (with horn receptacles. Page added August 27th 2016. Last updated February 1st 2018.